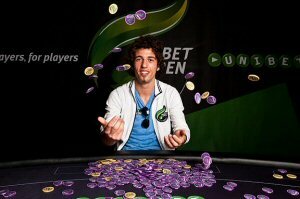 Mateusz Moolhuizen of Holland has won the first Unibet Open main event of 2011 taking down €117,000 for his victory in Malta at the weekend. Moolhuizen topped the 293-strong field in the €1,650 buy in event which created a prize pool of €417,525 at the Casino at Portomaso on the Mediterranean island on Sunday, clinching his victory with the heads up defeat of fellow Dutchman Tobias Peters. Moolhuizen started the heads up duel as chip leader with 2.96 million compared to Peters 1.4 million but the lead swung one way, then the other, then back again during the three-hour session. The final hand saw Mollhuizen push all in as chip leader with K-10 which dominated Peters K-6 which could not improve on the board thus sending Peters to the rail with €76,000 for second place. The next Unibet Open takes place online at Unibet.com on April 3, 2011 at 19:00 CET. The €300 + €20 buy in event has a guaranteed prize pool of €25,000 and players start with 10,000 in chips and a one hour clock. Players can qualify for these satellites via daily freerolls and €2 feeder satellites. The top 10 of the Unibet Open Online tournament will get points for the Unibet Open 2011 season leaderboard. The next live Unibet Open takes place in Barcelona from June 9 to 12, 2011. Qualification for this event is already underway at Unibet.com with freerolls and €2 feeders each day for €2,500 packages which include four nights accommodation, buy in to the €1,500 + €150 main event, daily breakfast and dinner and €300 towards travel expenses.